Videographer Paul Anderson, pianist Jon Schmidt, cellist Steven Sharp Nelson and music producer Al Van Der Beek. Paul Anderson, Jon Schmidt, Steven Sharp Nelson and Al Van Der Beek. “Growing up classical, Carnegie was sort of like the floating cloud that it seemed like you could never get to,” says cellist Steven Sharp Nelson, a former real-estate developer, who was pulsating with nerves backstage before the show. Appearing at the same venue as Tchaikovsky, Maria Callas and Bob Dylan, he adds, is an irrefutable validation of YouTube's star-making powers. 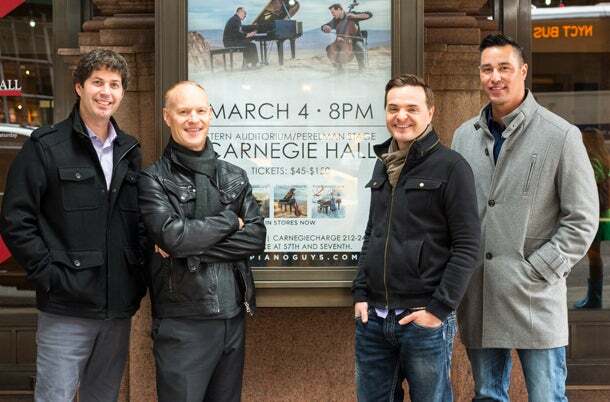 Before it was ever a musical quartet, The Piano Guys was the name of a piano store in St. George, Utah. As part of a social-media marketing strategy, the shop’s owner, Paul Anderson, asked Nelson and a local pianist named Jon Schmidt to perform in video clips he could post to the store's YouTube and Facebook pages. As audiences have grown, so has the scope of the video productions. Anderson, who serves as the group’s video visionary, has now set out to film in front of each of the Seven Wonders of the World. With the Great Wall and Redeemer statue (below) completed, he currently has his sights set on Chichen Itza and the Colosseum. “Taking classical instruments outside of the context of a concert hall and putting them up on a 1,000-foot cliff or on a moving train or on a beach -- that really fuels the shareability factor on YouTube,” he says. For fans, the soaring visuals have become as transporting as the songs themselves. Improbable mashups like Bach and Bruno Mars or Vivaldi and Let It Go appeal to wide swaths, says the group’s music producer, Al Van Der Beek. And as self-described classical music geeks, the guys often turn to their children -- there are a total of 16 among them -- for insight into today’s pop music scene. “What we’ve really been able to tap into is music that the entire family can enjoy,” Van Der Beek says. 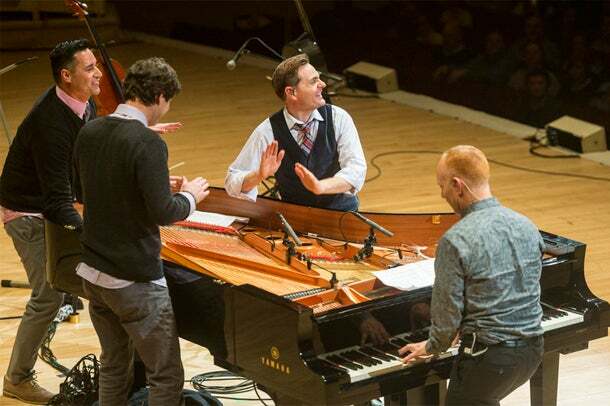 Given the power of social media and the universality of the compositions, the group has cultivated an international following, with sold out shows in England, Germany, Hungary, Japan, Russia and beyond. Next, they say, they’re eyeing gigs at the Sydney Opera House in Australia and London's Royal Albert Hall.